Lyft, the company behind the peer-to-peer ride-sharing app of the same name, has raised $60 million in Series C funding from the venture capital firm Andreessen Horowitz. It’s a huge round for the company, which is much loved for its community spirit and pink “carstaches,” but has also been much questioned for its practice of having regular people essentially act as city taxicab drivers in their own cars. The deal was a speedy one; it was negotiated over the course of the past week, said Lyft co-founder and president John Zimmer. And it brings Lyft to $83 million in total funding, having just raised a round about six months ago. Why so much money so fast? 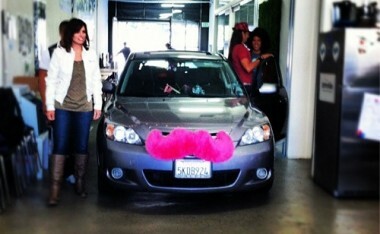 It’s to try to get Lyft to the next level, given the expansion, competition and regulatory challenges it faces. “We can scale globally in the next 12 months,” said Zimmer. For those paying close attention, Lyft was formerly known as Zimride, and it continues to operate a long-distance ride-sharing service under that brand, but it changed its name a month ago to reflect the momentum of the Lyft business, which is a year old. Andreessen Horowitz partner Scott Weiss, who led the investment, contended that Lyft differs from competitors like SideCar and Uber, which are both based in San Francisco as well and have been expanding nationally. He likes that Lyft’s mission is around “taking cars off the road,” not replacing or augmenting existing systems. Weiss noted that he’d been following Lyft closely, and saw the service grow from 14,000 rides per week two months ago (mostly in San Francisco, but expanding in other newer cities like Los Angeles and Chicago) to 30,000 rides per week now. Plus, he said, more than half of the company’s passengers are women, which says something about safety.